An Opinion On Sports: The French Open Final: Get Ready! Are you looking at this year's French Open Final pairing? Both Roger Federer and Rafael Nadal have advanced to Friday's semifinals at Roland Garros. Federer will face 59th ranked, 21 year old Gael Monfils, who will be making his first Grand Slam semifinal appearance. Nadal will duel with No. 3 Novak Djokovic, the reigning Australian Open Champion. If both advance, they will square off in their third consecutive French Open Final. 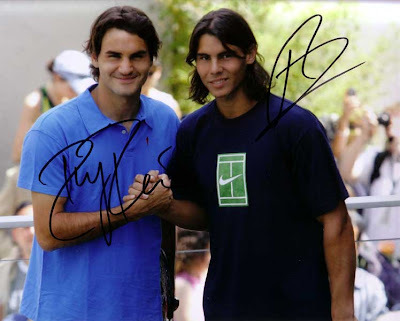 Nadal won the championship in both 2006 and 2007, and is regarded as the best clay court player in the world. On the other hand, many feel this title is the one most coveted by Federer, because it would complete a Career Slam for him. Who knows, this might just be the year for the world's number 1 ranked player to add his 13th major championship with a win at Roland Garros. If they both do reach the final, it very possibly could be "one for the ages"! If you're a fan of great tennis, you will not want to miss it.